LG Electronics (LG) announced that at CES, held in Las Vegas next week will introduce a new line of OLED TVs. Visitors will have the opportunity to see the world’s largest LG Ultra HD curved OLED TV (model 77EC9800), and 55 and 65-inch models OLED TVs. There will be an elegant GALLERY OLED TV (model 55EA8800) and curved OLED TV (model 55EB9600), caring towards the environment. “All models OLED TVs, which are presented at CES, offering the ultimate image quality, and a refined modern aesthetic,” – said In-Kyu Lee, vice president and head of the TV division, Home Entertainment company at LG Electronics. “LG will continue to use its expertise in the areas of technology and design to offer impressive OLED TVs, thus introducing the evolution of television in the next generation. LG’s TVs, diagonals 55 and 65-inch and 77-inch LG Ultra HD curved OLED TV combines LG’s WRGB OLED technology and 4K Ultra HD resolution screen (3840 x 2160 pixels) for a new level of image quality. Thus, the curved screen models LG 77EC9800, on a pedestal in the form of a leaf meets the viewer’s field of vision with high contrast picture. This 77-inch model received the Best of Innovations award at the 2014 CES Innovations Awards. LG Ultra HD curved OLED TV comes with ULTRA CINEMA 3D display. Thanks to technology Film Patterned Retarder-type (FPR) and Ultra HD, users can experience the most convincing 3D effect ever seen on TV. For more viewing options in high definition, LG TV 77EC9800 added its Tru-ULTRA HD Engine Pro, which can improve SD, HD or Full HD content into an image of almost 4K. 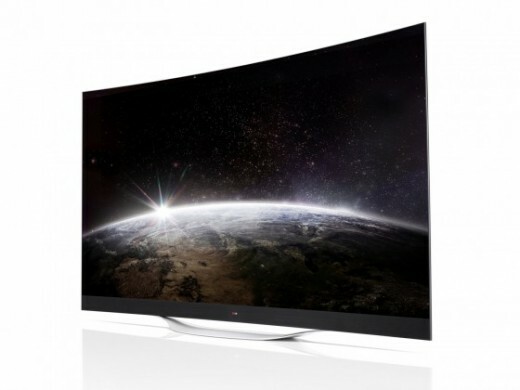 LG’s Ultra HD curved OLED TV can decode signals in formats H.264 and HEVC H.265 with 30p or 60p. Convenient built-in decoder, enables display of Ultra HD content from external devices connected to the TV via HDMI, USB or LAN ports. 77EC9800 model comes with the latest LG Eve Smart TV platform, so consumers can enjoy a simple and intuitive user experience. Hidden behind the elegant frame GALLERY OLED TVs, 2.2-channel Canvas speakers 100W power pointing forward, guaranteeing exceptional audio experience, previously unavailable on OLED TVs. Model EA8800-inspired by art was awarded the CES 2014 Innovations Award. A unique feature eGallery offers a variety of display options that can be activated to create a special atmosphere. LG’s latest curved OLED TV (model 55EB9600) is considerate towards the environment and represents the company’s commitment to responsible manufacturing. Specifically, is made from several materials that can be recycled and fewer parts than its predecessor. The model received a 2014 CES Innovations Award for its considerate towards the environment and superior build quality.